"Tupperware is a popular food storage solution. However, too often Tupperware parties are dreary heteronormative Christocentric occasions, leading to a crushing sense of ennui and crippling despair. 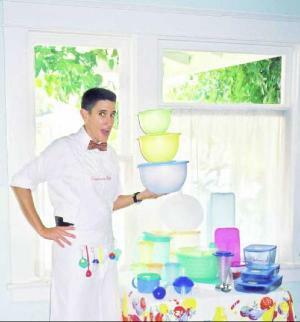 We experimented with over seventy Tupperware party configurations before discovering that having the party hosted by a surfing Jewish lesbian folksinger last heard from in 1989 allowed us to deliver the product without crushing the souls of housewives." *Not mad at this at all, but it does seem that there are places that need Tupperware alterity more than the 90048, where I imagine the most popular Tupperware alternative is sealing bowls with scraps of latex recycled from Von Teese photoshoots.